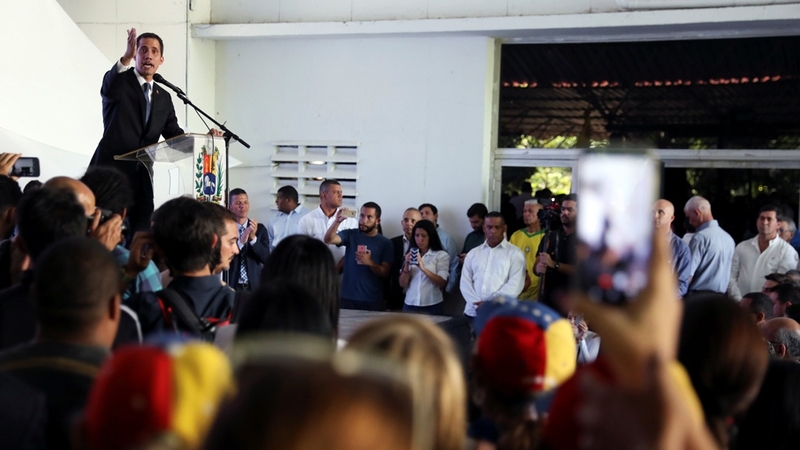 The announcement by state comptroller Elvis Amoroso, a close ally of Maduro, cited alleged irregularities in Guaido’s financial records and reflected a tightening of government pressure on an opposition movement backed by the United States and its allies. Guaido, who was elected to the assembly in 2015, has taken 90 international trips without accounting for the origin of the estimated $94,000 in expenses, Amoroso said. He also accused the opposition leader of harming Venezuela through his interactions with foreign governments, dozens of which support Guaido’s claim that he is interim president of the country. “We’re going to continue in the streets,” Guaido said soon after Amoroso’s statements on state television. He dismissed the comptroller’s announcement as irrelevant because, in his view, Maduro’s government is illegitimate. Guaido, the leader of the US-backed opposition-controlled National Assembly, has challenged Maduro and his socialist party for power. He invoked the country’s constitution to declared himself interim president in January, arguing Maduro’s May 2018 re-election was illegitimate. Electricty returned to most cities on Thursday following the blackout – the second major one in less than a month. On Wednesday night, Maduro blamed the outage on a “terrorist attack” on the Guri hydroelectric facility that provides electricity to most of the country. To deal with the power outages, Maduro announced a plan of “load management” for the coming days, without providing details. Generally, load management refers to the process of balancing the supply of electricity on a network with the electrical load. After blaming a “cyberattack” by the United States for the first outage, Maduro said this week’s blackout was caused by a gunman linked to the “perverse, diabolical right-wing” who fired on Guri. “Despite the attacks of the enemies to our Homeland our working class of #CORPOELEC, #PDVSA, #CVG and #SIDOR, are not resting as they [pursue] the recovery of the National Electric System.” President Maduro wrote on Twitter. “A heroic effort that recognises and appreciates the Venezuelan people. Congratulations Patriots!,” he added. “I do not think there has been any sabotage,” said Yolimar Arellano, a 43-year-old office worker in Caracas, who said he had electricity at his home, but still no water. He took three buses to get to his job because the subway was not working. The blackout came less than two weeks after electricity returned to most of the country following an outage that began on March 7 and lasted as long as six days in some cities. That blackout was the longest and most widespread incident of its kind in a country that has grown accustomed to unreliable public services.